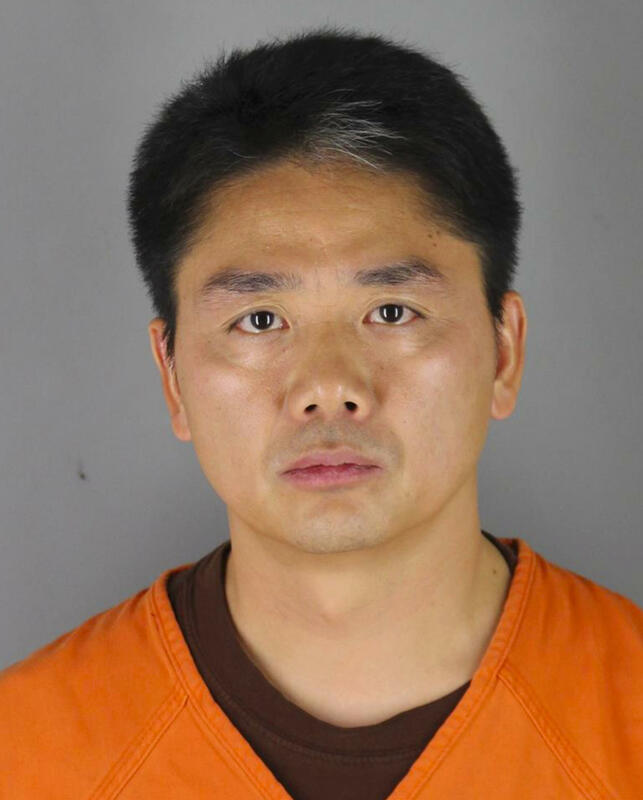 A photo provided by the Hennepin County Sheriff's Office shows Chinese billionaire Liu Qiangdong, also known as Richard Liu, the founder of the Beijing-based e-commerce site JD.com, who was arrested over the weekend in Minneapolis on suspicion of criminal sexual conduct. "We are putting resources to the investigation and our concern is to provide services to the complainant and to ensure that we're protecting the rights of Mr Liu," John Elder, a police department spokesman, told the South China Morning Post. Liu, 45, was reportedly back in China by Monday and had returned to JD.com headquarters Tuesday morning. The company issued a statement saying that Liu had been falsely accused and that police found no misconduct. Joseph Freiberg, a Minneapolis-based attorney apparently representing Liu, told The Minneapolis Star Tribune that he did not expect further developments in the case and said police had not seized Liu's passport. "Mr. Liu didn't do anything wrong, and the police have released him without any restrictions," Friedberg told the Star Tribune, adding, "I would bet my [law] license that he's not going to be charged." However, police spokesman Elder said, "We released him with the understanding that we were very confident we'd be able to reconnect with him as necessary in the investigation." The U.S. and China do not have an extradition treaty. The South China Morning Post reports that "Liu was in Minneapolis to take classes at the University of Minnesota, where he was enrolled at the school's Carlson School of Management to complete the American residency of a US-China business administration doctorate programme." Bloomberg further notes that the course is co-led by Tsinghua University, the alma mater of Chinese leader Xi Jinping, and that it "takes place mainly in Beijing with a singular cohort of students: the average age is 50, and many are captains of industry." Bloomberg estimates Liu's net worth at US$7.3 billion, while Forbes has it at US$10 billion. JD.com, listed on NASDAQ, saw its shares plunge nearly 6 percent on Tuesday to a 19-month low amid concern about the accusation. Bloomberg notes, "Liu's plight set Chinese social media afire, ranking among the 10 most popular topics on social media since Sunday. His orange-clad mugshot, memes and more than a million direct comments on the Twitter-like Weibo service have pushed important national events into the background, such as a much-vaunted Forum on China-Africa Cooperation in Beijing this week intended to tout the country's achievements and investments on the continent. Even pictures of a woman purported to be the alleged victim were allowed to proliferate in a country where the barest hint of political dissent invokes a widespread online censorship campaign." It is not the first time that Liu — sometimes referred to as the "Jeff Bezos of China" — has found himself caught up in controversy while abroad. In July, an Australian court lifted the suppression order that allowed Liu's name to be made public in connection a 2015 party at the billionaire's Sydney penthouse. Although Liu himself was not charged with any wrongdoing, a guest at the party, Longwei Xu, was found guilty of sexually assaulting a young woman he met at the party and took back to his hotel, according to The Sydney Morning Herald.